Switzerland's Federal Assembly, the federal legislature of the Swiss parliament, approved a motion on March 20 instructing the Swiss Federal Council, which serves as the country's collective executive head of government, to begin adjusting existing legislation to apply to cryptocurrency regulation. According to the press release, the Federal Council will now be responsible for "adapt[ing] the provisions on procedural instruments of the judicial and administrative authorities so that they can also be applied to cryptocurrencies. "Introduced by assemblyman Giovanni Merlini, the approved motion is meant to help the Swiss government "close gaps in protection against abuse" of cryptocurrencies, which Merlini says favors "extortion and money laundering.
" Specifically, Merlini hopes that, by adapting the existing laws, a clarification will be made regarding cryptocurrency trading platforms and whether they should be subject to regulation by the Financial Market Supervisory Authority (FINMA), Switzerland's financial regulator. While it is tempting to view the approved motion as an attempt to forcibly mold existing laws around a new type of financial technology they weren't designed for in the first place, a similar proposal made by Switzerland's Federal Council in December 2018 suggests the government branch will work with favorable flexibility in mind. At the time of the December proposal – which also asked that existing financial laws be adapted to "deal with new technologies including blockchain" – the Federal Council hoped to create "the best possible framework conditions so that Switzerland can establish and develop itself as a leading, innovative and sustainable location for fintech and blockchain companies. "Along with the Federal Council's plan to create a pro-crypto regulation framework, the government body also wanted to see a crackdown on the country's anti-money laundering laws. The Federal Council asked that the Swiss Federal Department of Finance conduct research regarding whether money laundering legislation should be adjusted in relation to certain forms of crowdfunding, as well as reworking the country's Money Laundering Act to more explicitly include decentralized trading platforms. While the Swiss government works to regulate the nascent financial technology, Swiss retail and financial businesses have been hard at work creating a crypto-friendly environment. Just this week, the Swiss online retailer group, Digitec Galaxus AG, announced it would begin accepting 10 different cryptocurrencies as payment options for its online retail stores, Digitec and Galaxus. 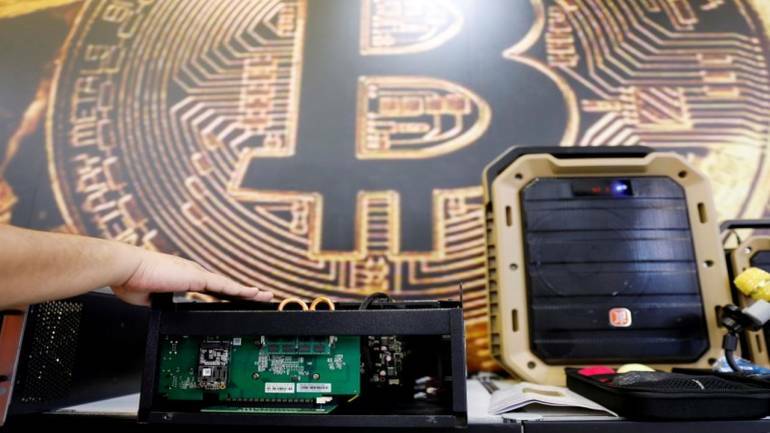 Additionally, earlier this month, an online banking and trading platform, Swissquote, unveiled the launch of its cryptocurrency storage service, which offers nuclear weapon-proof storage with servers held in a former military bunker within the Swiss Alps.Translations by Google. Francisco Gimeno - BC Analyst Switzerland started the blockchain and crypto hubs. But its national financial and banking laws have not been very friendly and many Blockchain and crypto start ups moved from there to better places. They are rapidly adapting, however, to this new environment, and that is no doubt awesome news for all things crypto and blockchain. Consider it confirmed: the Howey test is definitely the US Securities and Exchange Commission‘s (SECs) gold standard benchmark for deciding whether a cryptocurrency is in fact, a security. “Security” is a term used for describing certain financial assets that can be traded. It can refer to any form of financial instrument, even cryptocurrencies and associated tokens.Volume 0% Chairman Jay Clayton finally responded to calls to clarify how the SEC approaches classifying cryptocurrencies as securities. 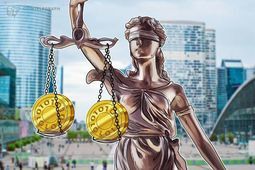 A set of political representatives formally submitted concerns a few months back, which were supported by digital asset think-tank Coin Center. His reply outlines the SECs stance clearly: the Howey test is its “litmus test” for detecting securities within the blockchain industry, and it’s entirely possible for digital assets once classified as securities to shed that definition altogether.This was enough for Coin Center to declare this a reinforcement of previous SEC statements, which deemed Ethereum (currently) too decentralized to be a security. The Howey test comes as a result of a legal battle from 1946. It’s really a framework for determining whether a particular asset is considered to be an investment contract (security). It is commonly used to enforce federal securities law. Clayton’s letter expressed that SEC regulators consider the “touchstone” of securities as “the presence of an investment in a common venture, premised on a reasonable expectation of profits to be derived from the entrepreneurial or managerial efforts of others. 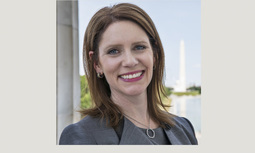 ”“Your letter also asks whether I agree with certain statements concerning digital tokens in Director Hinman’s June 2018 speech,” wrote Clayton. “I agree that the analysis of whether a digital asset is offered or sold as a security is not static […]. ”Whether a digital asset is considered a security depends on the circumstances and facts surrounding the original investment. Clayton gave an example: when investors (who have “pooled” assets to contribute to funding a project) no longer expect a dev (or group of devs) to carry out managerial or entrepreneurial efforts, their investment may no longer be considered a security. “A digital asset may be offered and sold initially as a security because it meets the definition of an investment contract, but that designation may change over time if the digital asset later is offered and sold in such a way that it will no longer meet that definition,” he added. Clayton also took time to really hammer it home to entrepreneurs in the cryptocurrency space. He noted many stakeholders have engaged with SEC regulators “constructively” and in “good faith,” but others have been preying on the excitement of retail investors to commit fraud. “The Division of Enforcement has brought a number of important cases in this area, and I have asked the Division’s leadership to continue to police these markets vigorously and recommend enforcement actions against those who conduct ICOs or engage in other actions relating to digital assets in violation of the federal securities laws,” he warned. Likely, Clayton is referring to a sudden string of settlements with fraudulent projects. In particular, Floyd Mayweather and DJ Khaled were forced to pay a combined $750,000 for failing to disclose endorsement deals with the CentraTech cryptocurrency. Around the same time, SEC authorities charged the founder of “decentralized” digital asset exchange EtherDelta with running an unregistered national securities exchange. He agreed to pay $300,000 in fines and penalties. “The Commission acted swiftly to crack down on allegedly fraudulent activity in this space, particularly where the misconduct has targeted Main Street investors,” boasted Clayton. “Regardless of the promise of distributed ledger technology, those who invest their hard-earned money in opportunities that fall within the scope of the federal securities laws deserve the full protections afforded under those laws. ”For the full letter, click here. For a breakdown of how cryptocurrency’s asset classification can change over time, click here. Francisco Gimeno - BC Analyst SEC stands on its Howey test to regulate tokens and cryptos hard way. That is why many ICOs are not open to American investors. SEC does well trying to curve fraud and scams, but should be also more open to adopt new strategies which embrace novelty. Regulatory uncertainty in Britain’s blockchain sector has emerged as one of the biggest concerns for distributed ledger technology firms in the country. According to research conducted by digital innovation agency Digital Catapult, 74% of blockchain firms in the United Kingdom cited regulatory issues as being one of their key concerns, surpassing other issues such as access to technical, business or legal expertise. These regulatory challenges include the European Union’s General Data Protection Regulation (GDPR). As the GDPR unifies Europe’s regulatory landscape regarding the use and storage of personal data, the legislation has become a sticking point for firms which use permissionless blockchains since the storage of data is not limited to any one particular geographical location. “This legislation raised concerns for companies using permissionless, public blockchains, which are open to anyone regardless of location, and where full copies of the database are replicated across all of the nodes participating in the network, making it impossible to selectively limit where the data goes,” Digital Catapult wrote in the report titled ‘Blockchain in Action: State of the UK Market’. Additionally, the GDPR empowers citizens to delete their personal data at any point and this is in conflict with the nature of permissionless public blockchains where data becomes immutable once recorded. The regulatory uncertainty surrounding the raising of funds via Initial Coin Offerings was also another cause of concern. 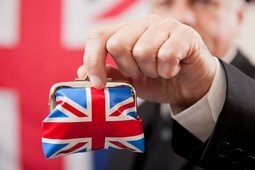 The report noted that the UK Financial Conduct Authorityhad indicated in April this year that it would regulate ICOs but has yet to issue formal guidance as at the publication date of the survey. “This uncertainty was raised many times by the companies consulted, as they were unsure whether they should conduct an ICO in the UK or allow UK citizens to participate given the current regulatory landscape. ”The regulatory uncertainty has also affected relationships between blockchain firms and traditional financial institutions. In the survey which polled 264 DLT firms, 54% of the blockchain companies indicated that they faced difficulties opening a bank account with the firms which were particularly hard hit being those dealing with cryptocurrencies. Additionally, the survey found that firms which had raised funds in crypto-assets found it particularly hard to obtain a traditional bank account despite the necessary Anti-Money Laundering and Know Your Customer checks being undertaken on investors. Despite the regulatory challenges, the report noted that the DLT sector in the UK is on a growth path with investments in the sector continuing to balloon:“…investments rose from just over US$50m in Q3 of 2016, to US$150m by Q2 of 2018 (with ICO-related investments topping US$100m in Q4 of 2017 and fiat investments climbing to over US$100m in Q2 of 2018). Francisco Gimeno - BC Analyst GDPR is a very good tool to defend personal data from those who want to profit from it. Companies dealing with blockchain should not see it as a problem but as a challenge, in order to work within it, as blockchain is also a liberating and disruptive tool of empowerment. 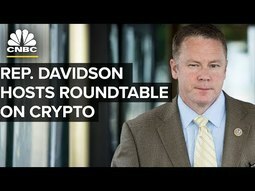 Rep. Warren Davidson hosts a roundtable at the Library of Congress to discuss Legislating Certainty for Cryptocurrencies. An idyllic lakeside town nestled in Switzerland is becoming the unlikely global control centre for blockchain and cryptocurrency. Zug has been dubbed “Crypto Valley” for attracting startups, ICOs and brain power but the country as a whole is carving itself out as the dominant thought and policy leader in the industry. With its culture of financial secrecy and favour for the ultra-wealthy, should we be asking whether this is such a good thing? Historically, Switzerland is synonymous with growing the wealth of the rich and hiding it away from the rest of the world to preserve it. Private banking, vaults of gold hidden deep within mountains and personal financial alchemy have become the country’s domain of expertize since the Japanese outdid them at watchmaking with their quartz technology. Why are the Swiss so interested in crypto? Since bitcoin was conceived as a way to send pseudo-anonymous transactions it is only natural that the Swiss would be interested in a technology that makes their job of hiding people’s money easier. Switzerland is the world leader in private banking and home to the world’s largest private wealth manager, UBS, with $2.3 trillion of assets under management for high net-worth individuals — Credit Suisse is the third largest wealth manager behind JPMorgan. Comparatively, this is over three times the annual GDP of the entire country. Both Swiss bank CEOs and policymakers are alert to the potential disruption crypto assets pose to this business if people really were to use them as a store of value as opposed to gold. These fears are shaping the corporate form of the industry as the Swiss create novel ways of integrating the new technology with its legacy financial sector. The price of bitcoin against the US dollar BTC/USD in red over gold and US dollar XAU/USD.One of the major benefits of crypto assets over the traditional physical storage of value, like gold, is precisely that it is digital and doesn’t need to be physically stored. However, an almost parodic industry has been created in Swiss wealth management - computer servers housing cryptocurrency private keys stored in Swiss gold vaults, hidden within alpine mountains. This month, the company that operates the Swiss stock exchange, SIX, announced its plans to launch a crypto trading platform that will be “the first market infrastructure in the world” to be fully regulated where digital assets can be issued and existing securities can be tokenized. The Swiss seem determined to put an “official stamp” on crypto first. With a population of just 8 million, Switzerland has a disproportionate representation in the financial world, with the world’s largest banks and the most influential financial think tank, the World Economic Forum (WEF), situated there. The not-for-profit WEF was created in 1971 by German economist Klaus Schwab who was also a business professor at the University of Geneva at the time. Its annual conference in the alpine town of Davos has become the Coachella of the financial world where politicians, bankers, CEOs, rock stars and celebrities of all kinds network apparently for the benefit of mankind. The invite-only event costs in the region of $72,000 for membership and a ticket — and as much as Davos has become the mecca for globalization and neo-liberal economics, it has also become a focus point for protestors who make an annual pilgrimage there to object to its corporate doctrine. In 2016, Schwab the 80-year-old progenitor of the WEF published a book titled The Fourth Industrial Revolution, outlining his thesis of the future economy and the chronology of the previous three — contrary to years of acceptance that there has been just two preceding revolutions. To propagate Schwab’s Fourth Industrial Revolution thesis, the WEF has established the Centre for the Fourth Industrial Revolution in the US. This month it also opened a centre in Japan and later this year will open centres in India and China. The centre says it engages with “governments, leading companies, civil society, and experts from around the world to co-design and pilot innovative new approaches to policy and governance in the Fourth Industrial Revolution. ”The centre is “co-designing and piloting policy frameworks and governance protocols across nine areas of focus” - among them AI, machine learning, IoT, drones and blockchain technology.The forum’s board of trustees is a diverse bunch of politicians, business people and royalty, among them former US vice president Al Gore and Alibaba founder Jack Ma. That global centres of research and policy-making for the future of these emerging technologies are taking place under the banner of one man’s book is almost unheard of — apart from Scientology’s L Ron Hubbard. Would we be receptive of Al Gore’s Centre for Inconvenient Truths that influenced global climate policy? Many countries are positioning themselves for the impending technology revolution — regardless which iteration — and many of them are smaller nations like Malta, Cayman Islands, Gibraltar and Lichtenstein that want to protect the financial centers that make up a significant part of their economies. Switzerland is no different in this regard but its expertise in growing and hiding the money of the world’s ultra wealthy and helping them circumventing jurisdiction tax laws is a culture antithetical to the “unbanking the banks” ethic that cryptocurrencies have sprung from. The WEF, while by no means an official representative of Switzerland, is the pinnacle of neoliberal economic thinking of a class of millionaires and billionaires that pushes for globalization uber alles (even though Trump’s protectionist policy has proven its powerful efficacy). The massive push of its Fourth Industrial Revolution doctrine espoused by one man is worrying and has the potential to take the financial power of cryptocurrencies away from the people they were created to empower. Francisco Gimeno - BC Analyst Places like Zug, Gibraltar, Malta or other so called blockchain hubs are needed. Some (and those are not few) think that this is also dangerous are TPTB (The Powers That Be) which are controlling the finances now will want to continue doing that through the control of the new 4IR. My take: there will be a fight between those who think they can control a revolution based in decentralisation and democratisation through new technologies, and those who believe the opposite. The fight will determine the time when the new societal paradigm is finally arriving. In all revolutions TPTB have just changed names and ways. But this one is different. This is, I think, the first historical revolution which will not be based on politics or "same collars different dogs", but on people's empowerment, beyond capitalism or socialism, communism or any -ism. And we must be always on guard to defend it.What do you think? Francisco Gimeno - BC Analyst Good words from somebody who is a convert from the "anti crypto" group. Technological innovation should have minimal regulation (and mostly in the ethical side) as the advantages would be better than the opposite. The jump from the technology to the application is where regulation should start to protect investors from pirates and scammers. France is becoming the tip of the European spear for the coming paradigm's change. Andrea-Franco Stöhr, the CEO of Switzerland's Crypto Finance Conference (CFC) and head of the legal team at Crypto Real Estate AG, agrees with Bernegger that regulations are holding Silicon Valley and other regions in America back from being leaders in the blockchain space. In particular, Stöhr points out this could be a result of the 2007-2008 financial crisis, which was primarily caused by deregulation in the financial industry. Considering that Silicon Valley has become home to significant innovations, the tech capital hasn’t been as open as Switzerland in terms of blockchain, cryptocurrency and DLT. The Security and Exchange Commission (SEC) has kept an even closer eye on cryptocurrencies following Bitcoin’s surge in December of 2017. Currently, the SEC is declaring all ICOs as securities and therefore are subject to strict regulations.Lessons Silicon Valley Can Learn From ZugYet when all is said and done, Bernegger believes that there are 3 lessons that Silicon Valley can really learn from the Swiss in order to catch up with Zug’s blockchain advancements. First, Bernegger notes that Switzerland already has a decentralized government system in place, so naturally Swiss entrepreneurs and investors believe in the idea behind blockchain. For instance, the blockchain-based voting system trial demonstrates how the Swiss government continues to look towards DLT for advancements. As Zug Mayor, Dolfi Müller, stated in a press release following the blockchain-based voting system trial, “Decentralized e-voting, data sovereignty and transparency are highest for the voters because of their individual comprehensibility. "Secondly, Bernegger credits the small, yet culturally diverse population of Switzerland - which consists of about 8 million inhabitants - for influencing new, technological ideas. And lastly, Bernegger notes that Switzerland is a very small market, encouraging entrepreneurs and investors here to think globally from day one.“If you completely ignore the potential and underlying technology of cryptocurrency, which can disrupt the existing economic system, you’ll miss some of the biggest future trends,” Bernegger warns. the legal and regulatory actions in Switzerland have further fueled Zug as the world’s “crypto valley.”Silicon Valley is lagging behind towns like Zug largely due to strict regulations and legal uncertaintiesIn order to help influence regions like Silicon Valley to come up with new ways for adopting blockchain, cryptocurrency and DLT, Bernegger and other Swiss investor are hosting Switzerland's next Crypto Finance Conference (CFC) in Half Moon Bay, located just outside of the San Francisco Bay Area. The previous CFC event was held last May at the exclusive Swiss ski resort, St. Moritz, and was attended by Federal Councillor and Head of the Federal Department of Economic Affairs, Education and Research of Switzerland, Johann N. Schneider-Ammann, along with high-level investors and entrepreneurs, all of whom the CFC board members had to personally approve to be invited. Ultimately I think it’s the regulation behind these regions that will define if new cryptocurrencies and blockchain technology can really succeed. As long as you have a very “crypto-unfriendly” political mindset, it’s difficult as an entrepreneur to create a real big company. We hope to change this,” said Bernegger.You can follow Rachel Wolfson on Twitter and LinkedIn to stay up to date on the latest cryptocurrency happenings. 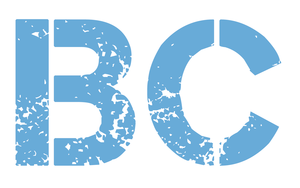 Francisco Gimeno - BC Analyst The ideas behind this article are very common sense. It is very difficult to change this in short time. The blockchain revolution is starting slow, like all real revolutions, where the circumstances are already right like in Zug, but the impact all over the world will be global, and will happen faster than we think with the technological acceleration in place. We will be choosing sides now in this transformation. Startups, developers and investors took notice over the past year as ICOs (Initial Coin Offerings) emerged at center stage as a novel, accelerated path of capital formation in the context of the rapidly growing blockchain economy. ICOs are creating considerable momentum in the blockchain innovation wave. This year alone, companies have raised approximately $1.5 billion using an ICO or similar token based fundraising scheme. Will your company benefit from an ICO? The presentation covers the risks and advantages of ICOs and alternative capital formation paths that companies, and especially startups, should consider as they navigate the universe of blockchain development. Giovanna Fessenden has expertise in protecting blockchain innovations for her clients. She discussed how a company that may be considering an ICO can obtain a solid foundation for its intellectual property rights. Giovanna will delve into what makes a strong technical white paper that details the company's technology and innovations. 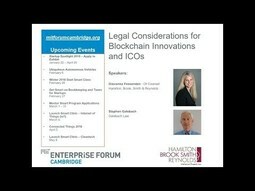 She also will discuss some of the intellectual property risks/benefits for deploying blockchain innovations. Stephen Galebach advised a recently completed ICO that featured the first known published legal opinion letter on the inapplicability of the securities laws to the particular tokens being sold. Stephen will speak about the Supreme Court’s Howey test as applied to real world examples to determine whether an ICO represents an offering of securities and thus falls under SEC regulatory jurisdiction. Francisco Gimeno - BC Analyst The business aspect of Blockchain and crypto is finding some legal challenges around the world, US being the most clear example, with SEC trying to regulate ICOs, tokens, investments, etc. This outstanding panel helps a lot to understand what legal issues Blockchain ICOs and other investments related to Blockchain and crypto are expecting to find around. We all need to understand this. The Internet has dramatically expanded the universe of business models that rely on fast and cheap communications with a multitude of potential customers. This very characteristic, however, provides a fertile environment for unscrupulous marketers seeking to profit from illegal pyramid and Ponzi schemes. Imagine a “chain letter” that could be sent to tens of thousands or more recipients without postage costs, perhaps even through bots, or Ponzi schemes targeting the same number of potential investors. Simple “multi-level marketing schemes” (MLMs) in the realm of online commerce were indeed among the first to attract attention from enforcers seeking to apply familiar anti-fraud principals in the digital world. By and large those efforts were successful. Court decisions and governmental guidelines made clear that the old rules apply in the turbocharged world of the Internet as well. Business evolves, however, and many new models are raising the same potential enforcement issues. Paramount among these developments is the rise of “virtual currencies” or “cryptocurrencies,” whose acceptance has brought a new complexity and urgency to the analysis. Cryptocurrencies are speculative ventures, some entirely market-based and others not, whose structure and promotion lend themselves to fraudulent conduct. Significant regulatory attention has already been directed to cryptocurrencies in connection with the securities laws. This article describes the basic rules for determining whether online promotions are otherwise illegal frauds and discusses some of the current models to which that analysis might be applied.Ponzi, Pyramid, and MLM SchemesAlthough related, Ponzi, Pyramid, and MLM schemes differ in key ways and are treated differently by antifraud laws. A more general business model is the MLM, also known as multi-level referral or membership systems, in which new members of an organization pay an initiation fee for the right to make sales of a product or service and thereafter receive a share of the fees taken from, and sales made by, each additional member they themselves recruit. Early members at the top may well stand a strong chance of prospering, but the further down the pyramid a member finds itself the harder it will be for the scheme to be profitable. The legitimacy of the “sales” opportunity is key to finding that an MLM is lawful. If the “sales” opportunity is not bona fide, MLMs take on certain characteristics of Ponzi schemes. Where participants’ income is principally derived from recruiting new members and receiving a share of their membership fees, opportunities for profit decline predictably as the supply of new recruits dwindles. Such ventures are called pyramid schemes, and generally are considered to be illegal. Examples of Enforcement Actions Against Online Marketing SchemesPyramid scheme: BurnLoungeAccording to published judicial opinions, BurnLounge was a membership-based online music marketing program that operated between 2005 and 2007, and an early example of an MLM in the internet age. In addition to an online music store, BurnLounge promoted a business opportunity in which customers could themselves become resellers of the same music and music-related merchandise, and participate financially in the recruiting of new members. Customers could do business with BurnLounge by: (1) buying music and merchandise; (2) buying a membership package to become an “Independent Retailer,” which enabled resellers to earn money from direct sales as well as to earn music and merchandise credits for selling new membership packages; and (3) buying a membership package to become a “Mogul,” which enabled them to earn money from direct sales and by selling membership programs to new customers. In 2007, the Federal Trade Commission filed suit against BurnLounge to enjoin its operations as an illegal pyramid scheme and seek disgorgement from the company and its operators to fund customer redress. In its two-year existence, BurnLounge generated more than $28 million in revenue, $26 million of which was attributable to sales of membership packages and membership fees. More than 90% of BurnLounge members never recouped their initial investment, and at trial the FTC expert testified that under the best possible circumstances, 87.5% of members would never be expected to do so.The FTC prevailed in a 2012 trial against BurnLounge, and the district court’s judgment was affirmed by the U.S. Court of Appeals for the Ninth Circuit in 2014. In its opinion, the Ninth Circuit applied non-Internet law on MLMs to conclude that an MLM program is an illegal pyramid scheme where participants pay the company for: (1) the right to sell a product; and (2) the right to receive compensation for recruiting other participants into the program, where such rewards are unrelated to sale of the product to ultimate users and are the “focus” of the program. The Ninth Circuit agreed with the district court that BurnLounge required purchases of a membership package to participate in the sale of merchandise and music, and that the “focus” and primary motivation of the membership program was the recruitment of new members, rather than the sale of products or services to consumers. Ponzi scheme: SEC v. Receiver for Rex Ventures Group LLCAccording to a complaint filed by the SEC, Paul Burks formed ZeekRewards in 2011 as an “affiliate advertising division” of his penny auction website Zeekler.com, which offered customers the ability to place one-cent increment bids on merchandise. Participants were solicited to become investors, or “affiliates,” in ZeekRewards through investment contracts called the “Retail Profit Pool,” as well as a pyramid-like referral scheme called the “Matrix.” Neither of these investment opportunities was registered with the SEC or any state regulatory authorities. Despite ZeekRewards’ representations to investors that the scheme was extremely profitable, the SEC alleged that 98% of the company’s revenues and payments to investors were derived solely from funds contributed by new investors. Furthermore, the scheme only remained viable because current investors were actively encouraged to “roll-over” their “profit points” back into the scheme. By the time the SEC took action to stop the scheme in August 2012, the amount of outstanding “profit points” due to participants was nearly $3 billion. Beyond these outstanding liabilities, the SEC alleged that had investors chosen to receive “profit points” in cash rather than re-invest, ZeekRewards would have required daily cash outflows of $45 million, far in excess of its revenues, and would have been rendered insolvent in a matter of weeks, if not days. After several years of litigation, Burks and several others at Zeekler and ZeekRewards ultimately pleaded guilty to running a Ponzi scheme, paid significant fines, and were sentenced to substantial prison terms. Burks himself was sentenced to 15 years in jail and ordered to pay $244 million in restitution for his role in the scheme. The SEC also seized all assets of both companies and appointed a receiver to distribute the companies’ assets to the nearly one million harmed investors. 2. Whether particular wholesale purchases by participants were made to satisfy personal demand, or amount to mere “inventory loading” in an attempt to advance in the marketing program. Because the FTC believes that the compensation structure of a legal MLM program must be based on actual sales to legitimate customers, the guidance stresses the importance of MLMs properly documenting of actual sales. A Primer on CryptocurrenciesBitcoinCryptocurrencies are cryptographically-secured digital currencies built on the principle of a blockchain. The Bitcoin blockchain is a distributed ledger of cryptocurrency transactions. Transactions with the cryptocurrency are recorded in ledger entries, or “blocks” of the blockchain. The Bitcoin blockchain itself is publicly-visible and decentralized, and as transactions occur and blocks are added to the blockchain, the transactions are validated by individual users performing increasingly complex mathematical calculations. Users are incentivized to perform these calculations and validate additions to the blockchain by the reward of newly-issued cryptocurrency. Other CryptosInspired by the success of Bitcoin and the impressive fortunes of its early and even recent investors, promoters have issued many other cryptocurrencies since the inception of Bitcoin-by one published estimate, 1574 as of April 2018-aided by the ease and low cost of issuing a new cryptocurrency. Bitcoin is by far the largest by market capitalization (approximately $137 billion as of April, 16, 2018), followed by Etherium ($50 billion), Ripple ($26 billion), Bitcoin Cash ($13 billion), and Litecoin ($7 billion). Cryptocurrency Promotion ModelsBitcoin itself is not officially promoted, as its management and control is significantly decentralized. However, various third parties promote the acquisition and use of Bitcoin in a variety of ways. According to published sources, for example, MerchantCoin was introduced in 2014 as a payment service which issued its own cryptocurrency tokens (XMC) for the purpose of incentivizing consumers, advocates and businesses to acquire and use Bitcoin. Under MerchantCoin’s program, participants who use the MerchantCoin network to transact in Bitcoin are rewarded with XMC, a cryptocurrency issued by MerchantCoin which can then be exchanged for Bitcoin. MerchantCoin also introduced a “Social Media Mining Program” that “empowers advocates to earn immediate (XMC) tokens by encouraging their friends, family members and business associates to share MerchantCoin’s exciting news through Social Media,” such as by “sharing MerchantCoin updates on Facebook, re-tweeting, joining our Google+ group and educating the public about MerchantCoin at bitcoin meet ups.” Notably, Facebook has banned all ads promoting cryptocurrencies, including Bitcoin and all Initial Coin Offerings (“ICOs”). Some cryptocurrency promotion models have come under scrutiny and criticism as potential pyramid or Ponzi schemes. One example is the now-defunct Bitconnect. Before it was shuttered in early 2018, Bitconnect was an anonymously-run site where users could loan their cryptocurrency to the company in exchange for outsized returns depending on the term of the loan, e.g., a $10,000 loan for 180 days would purportedly give the lender ~40% returns each month, with a .20% daily bonus. Bitconnect used investment funds to invest in Bitcoin by way of Bitconnect’s proprietary “trading bot and volatility software.” To participate, users were required to buy Bitconnect’s own currency, BCC, and so buying into the scheme naturally drove up the price of BCC. Bitconnect also had a thriving multi-level referral feature, under which participants were rewarded for using social media to drive signups for the program. In November 2016, the British Registrar of Companies served BitConnect with a notice for compulsory strike-off, threatening to shutter the company and dissolve its operation unless further action was taken. The Texas Securities Board and North Carolina Securities Division on served Bitcoin with cease-and-desist orders in January 2018. Both orders accused Bitconnect of fraud and characterized the operation in terms reminiscent of a Ponzi and pyramid scheme, with the North Carolina order even noting that Bitconnect’s large guaranteed annual returns constitute a “red-flag” for fraud, and specifically for the risk that the program may be a Ponzi scheme. Shortly thereafter, Bitconnect announced that it was shutting down its lending and exchange programs with immediate effect. Several arguably similar programs have been launched based on other cryptocurrencies. Some are now reportedly dead, including XRPConnect and NEOConnect, while others persist, such as EthConnect, based on Etherium. Another model employed by some involves the launch of a cryptocurrency through funds raised by selling the currency at a significant discount (e.g. 75%). Thereafter, the promoter raises more money by offering the currency at smaller discounts that it sets over time. So long as the original buyers are free to dispose of their holdings at any time and new buyers continue to arrive, the early investors have an almost automatic and profitable cash-out. The lawfulness of these models has not been tested but, aside from potential securities law issues, would appear to warrant close scrutiny in connection with representations that are made to both early and subsequent investors and the reasonableness of the projections they make. Enforcement Issues Raised by Cryptocurrencies and MLMsCryptocurrencies in general are not inherently pyramid or Ponzi schemesSome commentators have argued that cryptocurrencies are inherently pyramid or Ponzi schemes. But it is difficult to find legal precedent supporting so sweeping a claim. Despite their novel structure, ephemeral nature, and lack of a tie to any inherent valuation, cryptocurrencies are in many ways a relatively straightforward speculative vehicle, perhaps akin to traditional assets subject to “bubbles” in which their market values become detached from underlying asset values. While these speculative bursts attract illegal promotion and marketing schemes, the baseline legal advice for the enterprise as a whole may well be “let the buyer beware. ”That said, several features of cryptocurrencies and derivative products are particularly susceptible to manipulative conduct by fraudsters. These include: (1) the decentralized structure of cryptocurrencies, with no central management or reporting; (2) the ready access to amateur investors provided by social media; (3) the ease with which amateur investors can invest in cryptocurrencies; (4) the apparent boom-and-bust nature of at least some cryptocurrencies; (5) the relative lack of specific regulation of cryptocurrency trading and marketing; and (6) the FOMO (“fear of missing out”) culture that has arisen around cryptocurrencies in general. An interesting twist on enforcement issues is that the fervor surrounding cryptocurrencies and the dangers that they can pose are discussed on a daily basis in public as well as financial media, finding their way even into the comedy monologue of John Oliver on his HBO show, Last Week Tonight. Someday a cryptocurrency scheme under attack may cite these discussions to argue that no allegedly injured investor was unwary of risks, or even the potential for fraudulent conduct. Key Questions to Ask About Crypto Sales and Marketing ProgramsThose considering launching a new cryptocurrency or starting a venture that markets or promotes existing cryptocurrencies would be well advised to consider several key questions to avoid stepping into the legal minefield of pyramid and Ponzi schemes. 1. How is the opportunity for profit being described?This is perhaps the most important question of all. The promise of outsize profits is common to both Ponzi and pyramid schemes and a certain “red flag” for regulators, particularly when returns are characterized as certain or guaranteed. The same reasoning should apply to the promotion of cryptocurrencies. Risk factors should not be minimized to the point that they are misleading. While there is always room for some level of sales puffery, advertising unachievable results, or the likelihood of profit too widely shared is certain to attract enforcement attention. Promoters should also bear in mind that their statements would be reviewed after-the-fact, from the possible perspective of a failed investment. The use of unrealistic hypotheticals that do not represent what most investors will be able to achieve are particularly subject to being second-guessed in light of widespread losses. 2. Will participants make money through sales of the underlying cryptocurrency or product, or is the focus on referrals? As the Ninth Circuit’s decision in BurnLounge makes abundantly clear, programs that “focus” on recruiting new members rather than delivering profit from the sale of products or services to actual customers are much more likely to fall afoul of laws prohibiting pyramid schemes. Referral programs are of course commonplace and not inherently unlawful, but the structure of such programs must be carefully considered so that the legitimate sale of products and services-sales reflecting genuine, organic demand-form the backbone of a venture’s promise of profitability. Any venture that will become insolvent or fail to make good on its representations absent an ever-increasing influx of new investors and capital raises serious concerns. Again, at one level the problem may be organic: Is the venture bound to fail, given the laws of mathematics or even reasonable assumptions? At another, problems are ones of unrealistic promises. Guaranteeing returns or projecting profits based on factors other than legitimate and defensible factors of supply and demand are sure to attract unwarranted attention. 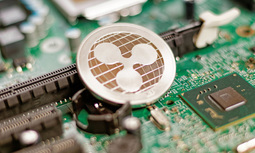 The fact that adherence to guidelines designed to reduce legal risk may make marketing an opportunity more difficult makes the point that the guidelines are sound.In connection with cryptocurrencies, specifically, the need for an influx of new capital will likely be required for a currency to achieve a viable level of acceptance and scale. But this is not the same as a need for an ever-increasing influx of funds, and a disclosure of viability risks certainly does not immunize other misleading statements. The Internet has delivered new products, new means of promoting products, and new means of transacting business. Increasing interconnectedness and frictionless commercial transactions are both a boon and a curse, opening the door to new takes on old frauds. Cryptocurrencies in particular, by their very nature speculative assets, show both the best and the worst of what the new digital world brings with it. The enormous surge in popularity they have experienced and the “fear of missing out” that has driven their growth are yellow if not red flags. Many unsophisticated investors have put their money into these unproven and risky assets, some number of them, no doubt, drawn to the game through conduct that likely would be judged illegal. The good news is that many important legal questions will be analyzed using relatively settled law. Conducting the necessary analyses, and heeding the lessons they teach, are the best defense for promoter and participant alike. Moizés B. Londe Free-lancer I fell that alt-coin are here only to make everything worst. I'll be always a bitcoiner and that's it. Francisco Gimeno - BC Analyst In cryptos, a week is a long time. Volatility, new alt coins promising wonders, FUD news and FOMO are very normal. It is yet a place where scammers and fraudsters can have their benefit from investors who don't do their homework before. Be wary when walking on the crypto roads.